We have a Liebster Award! A ma grande surprise j'ai été nominée pour un Liebster award (et non "Lobster" comme j'ai cru lire tout d'abord). Très discrète de nature j'espère ne froisser personne ce faisant ! Je me dis que c'est une bonne occasion de montrer mon appréciation à d'autres blogs (voir ci-dessous). Pour corser un peu les choses j'ai été nominée en anglais mais je vais nommer des blogs en français. Wow, great, I thank you Paul ;-) for the nice Christmas gift ! iii. Nominate up to 11 other bloggers to receive the Liebster, and give them 11 questions to answer in turn. 1. What talkie should be re-made as a silent film? Very tricky question, many talkies are remakes of silents films ...to remake them would be like the snake biting its tail! I don't see any, they just don't make them like they used to, I wish they could. 2. What was your favourite live silent film viewing experience and why? Oops, sorry, I'm ashamed to admit that I never had the chance to watch a live silent film, I wish I had. Believe it or not I live far away from civilization! 3. Which is your cinematic guilty pleasure – a pop film you just enjoy for the heck of it? 4. Your favourite film with a dream sequence… without revealing major plot spoilers! Dream awake or dream asleep? Dream evocation, nightmare or simple fantasy? The first to come to mind is a nightmare sequence in one of my favorite film The Best Years of our Lives - Fred (Dana Andrews) experiments a sweaty nightmare of a disastrous bombing run over Germany. 5. Name a book you have read at least twice and why? 6. If you’re not watching films (or writing about them) … what do you do? What is your second favourite hobby? 7. Vinyl, CD or digital? Well, I started with vinyl, I listen CDs at home and digital in my car.... Mostly CD's though. 8. What the World needs now is…? One cannot stop fear, anger, jealousy, desire, greed, hate, delusion, etc so the world needs LOVE of course ! 9. Name a major drama film which the casting alone could have turned into a comedy or vice versa? For example, Woody Allen in Ben Hur or Charlton Heston in Annie Hall. 10. An actor or actress you simply have to watch in every role? Only one ? I simply have to watch all the movies with every actor or actress who impressed or moved me once. 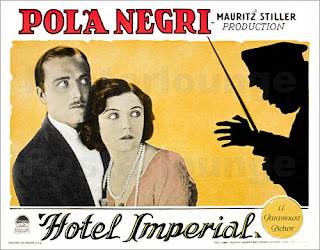 I'm sometime disappointed though - for instance I had an immediate crush on James Hall during the first minutes of Hotel Imperial (Mauritz Stiller). I watched all the films I could find with Mr Hall but never had an other chance to watchhim again in such a good role. 11. What was your favourite album aged 15 and your favourite now? Can art endure through our maturation or was Albert Camus right about those first things that really move us…? My family only listened to classical music, pop music was considered to be decadent. I was around 14 when I first listened to the Beattles! Later I discovered many other bands. At that time I was loving rock prog, I still do, and I still love classical music. Could it be I don't mature too well? 10. I'm curious. La curiosité est un vilain défaut (curiosity kills the cat) is a french expression I never quite could understand. Un film qui vous a particulièrement marqué et pourquoi, si ce n'est pas indiscret ? Quel livre avez-vous lu plus d'une fois ? Prenez-vous le temps de lire d'autres blogs ? Si oui le(s)quel(s) ? Quel film avez-vous vu plus d'une fois dans un cinéma ? Salut Caroline - qui est un amusement lire et votre anglais est bien meilleur que mon français ! Je suis d'accord à propos de prog rock et la musique classique - les choses que nous aimons vraiment ne changent pas tant que nous changeons ! Je veux l'alternative 12 Angry Nains , ours et Boucle d'Or et Sylvester Stallone comme Charlie ! Ils devraient peut-être refaire Rambo comme un silence trop ? Avoir un beau cadeau de Noël ! Merci, pour avoir choisi mon blog.